A Herniated disc is a fairly common structural issue that is often the cause of chronic pain conditions. The spine is made up of individual bones called vertebrae. 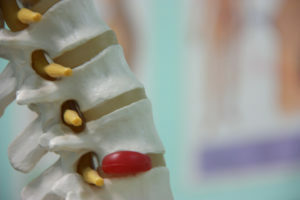 Between each vertebra is a disc that is made up a soft core surrounded by a fibrous outer layer. This structure is what allows the spine to be flexible. When one of the discs is torn or otherwise damaged, however, the soft inner core can start leaking out, leading to what is known as a herniated disc. In most cases, a herniated disc is not caused by just one situation. For the most part, the discs are durable and respond well to outside forces. However, they are prone to repetitive injuries. Things like sitting in a position that puts stress on your spine or frequent incorrect lifting can weaken these structures. Only rarely are herniated discs caused by sudden traumatic injuries. Typically, the herniated disc occurs as the result of aging, disc degradation or several years of improper lifting or posture. At Denver Physical Medicine & Rehab, treating herniated discs is one of our specialties. Using advanced diagnostic tools, non-surgical spinal decompression techniques, and physical therapy, we can relieve your pain and restore your spine to a more healthy state. Denver Physical Medicine & Rehab is different from other clinics because we take a multidisciplinary approach to treating herniated discs. While others may focus on just one component of treatment, we are able to provide incredible results through a variety of therapies and techniques. Following your initial consultation, our team will put together a comprehensive treatment plan that may include a number of therapies, such as medical massage, physical therapy, and Spinal Decompression treatment. By combining a number of treatments into one cohesive plan, we can provide you herniated disc long-term relief. Our Spine clinic, we have patients get really good positive results for herniated disc treatments and are proud to be the pioneers of combining several therapies for effective results. If you are suffering from a herniated disc in Denver, contact a Denver physical therapist – Denver Physical Medicine & Rehab today to request a complimentary evaluation. Call 303-757-7280.